Uniforms and spiritwear are available through Louisville Sporting Goods. It is each parent's responsibility to purchase your child's uniform. Girls uniform is a racing singlet and boy shorts. Boys uniform is a racing singlet and uniform shorts. Black sports shorts are also acceptable. Our vendor also has lots of great options for strider fans such as hats, jackets and sweatshirts. Check Louisville Sporting Goods for current options. 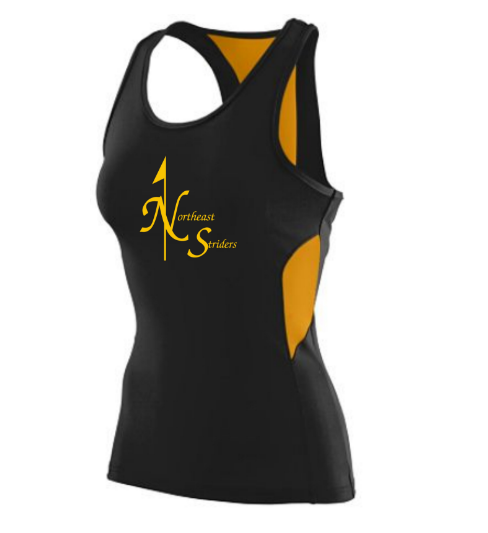 Processing time takes several weeks, so be sure to order early to have uniforms in time for your child's first meet. You may select shipping direct to your home, or choose to pick up in store. Once purchased, uniforms are your property. Melanie French is the board member in charge of uniforms. Please contact Melanie if you have any questions about Uniforms & Spirit Wear. Welcome to black and gold!